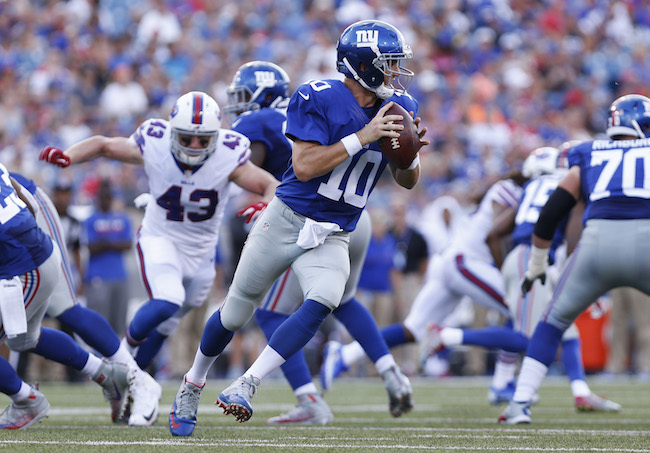 The New York Giants were shutout by the Buffalo Bills 21-0 at New Era Field in Orchard Park, New York on Saturday. The Giants are now 0-2 in the preseason under new Head Coach Ben McAdoo. The offense was pathetic, accruing only 166 total net yards, 64 net passing yards, and seven first downs. And 67 of those yards came on one run by back-up running back Bobby Rainey in the 4th quarter. In four series, the starting offense gained only 23 net yards and one first down. Both pass and run blocking was terrible and the Giants turned the football over four times. The only time the offense seriously threatened – in the fourth quarter – kick Tom Obarski missed a 27-yard field goal. The individual offensive stats also tell a horrific story. Eli Manning completed 4-of-9 passes for 44 yards, Ryan Nassib 2-of-12 passes for 25 yards and one lost fumble, and Logan Thomas 2-of-4 passes for 17 yards and two interceptions. Rainey had 70 yards rushing (with 67 yards coming on one late run). 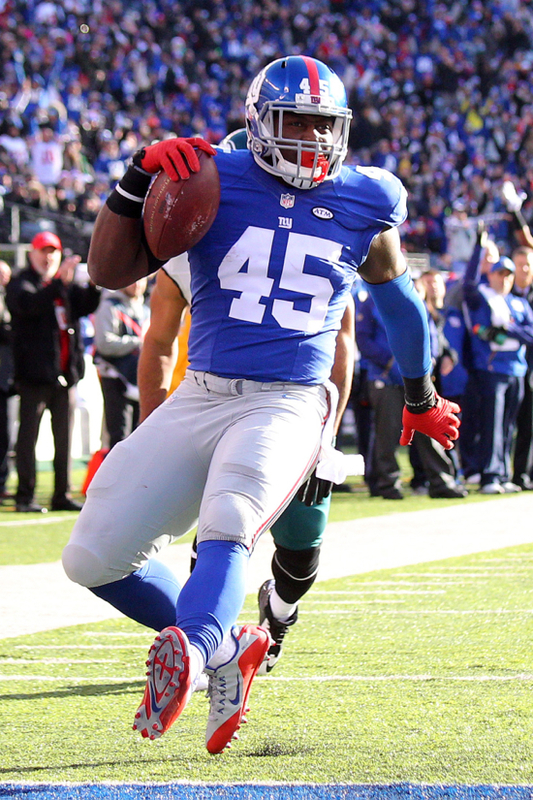 Four other running backs carried the ball 14 times for 29 yards with one lost fumble (by Andre Williams). The Bills scored all of their points in the first half, with their scoring drives starting from the Bills 48-yard line, Giants 49-yard line, and Giants 19-yard line – the latter coming after Nassib’s fumble with 24 seconds left before halftime. Overall, the Giants defense allowed 343 total net yards (70 rushing and 273 passing) with 216 of those yards coming in the first half. Safety Landon Collins saved more humiliation when he forced a fumble on 3rd-and-goal from the 1-yard line in the first quarter. The ball was recovered by defensive tackle Damon Harrison in the end zone. Cornerback/safety Cooper Taylor also intercepted a pass in the fourth quarter. Cornerback Janoris Jenkins, defensive end Olivier Vernon, and defensive end Romeo Okwara each had sacks. Not playing were WR Victor Cruz (groin), WR Geremy Davis (hamstring – did not make trip), TE Will Johnson (burner – did not make trip), LG Justin Pugh (shoulder), DE Kerry Wynn (groin – did not make trip), LB J.T. 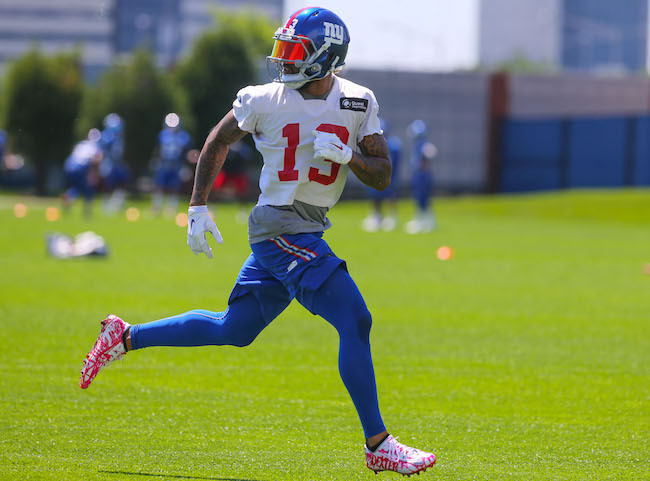 Thomas (hamstring – on the PUP – did not make trip), CB Eli Apple (strained leg muscle), and CB Leon McFadden (bruised lower leg – did not make trip). WR Dwayne Harris (knee, x-rays were negative) and S Mykkele Thompson (concussion) were injured in the game. No word yet on the severity of the injuries or how much time either will miss. 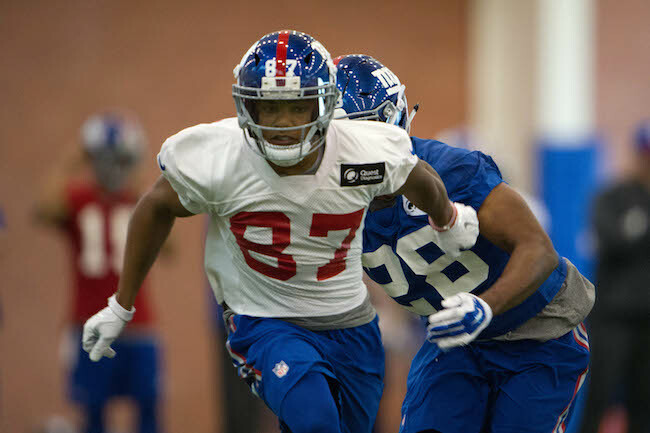 The first day of the New York Giants mandatory 3-day mini-camp was held on Tuesday at Quest Diagnostics Training Center in East Rutherford, New Jersey. The mini-camp will continue with practices on Wednesday and Thursday. Running back Orleans Darkwa (fractured leg), tight end Matt LaCosse (lower leg), offensive guard Ryan Seymour (torn ligament in hand), offensive tackle Byron Stingily (unknown), defensive tackle Montari Hughes (lower leg), linebacker J.T. Thomas (lower leg), safety Cooper Taylor (sports hernia), and safety Mykkele Thompson (lower leg) did not practice. The starting safeties were Landon Collins and Darian Thompson. The second-team safeties were Nat Berhe and Andrew Adams. The third team safeties were Bennett Jackson and Justin Currie. Cornerback Trevin Wade lined up as the starting nickel cornerback. Dominique-Rodgers Cromartie played the slot cornerback position some with Eli Apple and Janoris Jenkins outside. Running back Shane Vereen beat safety Landon Collins for a big gain down the left sideline. Linebacker Jonathan Casillas dropped an interception on an underneath pass from quarterback Eli Manning. Tight end Ryan Malleck made a leaping grab against defensive end/linebacker Brad Bars. Malleck later ripped down a pass away from cornerback Matt Smalley. Wide receiver Sterling Shepard made a nice sliding catch on a comeback route against cornerback Dominique Rodgers-Cromartie. Shepard also caught a touchdown pass from Manning in the red zone on a dig route. Wide receiver Myles White beat cornerback Eli Apple on a slant in the endzone for a touchdown. Apple later broke up another pass intended for White. Cornerback Trevin Wade ripped the ball away from wide receiver Sterling Shepard and returned it for a touchdown. Wide receiver Tavarres King caught a touchdown pass from quarterback Ryan Nassib. Giants.com wide receiver Victor Cruz highlights (VIDEO). The seven remaining OTA practices will be held June 1-3, June 6-7, and June 9-10. 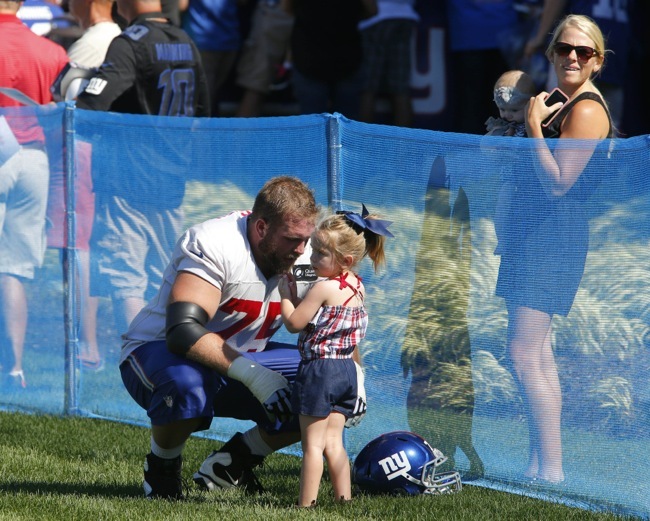 The Giants will hold a mandatory, full-team mini-camp on June 14-16. The New York Giants have officially signed unrestricted free agent offensive tackles Byron Stingily (Pittsburgh Steelers). Following up on yesterday’s updates, the Giants have also officially confirmed the signing of unrestricted free agent running back Bobby Rainey (Tampa Bay Buccaneers) and unrestricted free agent linebacker Kelvin Sheppard (Miami Dolphins). The 27-year old, 6’5”, 318-pound Stingily was originally drafted in the 6th round of the 2011 NFL Draft by the Tennessee Titans. The Titans waived him in September 2015 and he then signed with the Pittsburgh Steelers in October 2015. In five seasons, Stingily has played in 20 regular-season games with nine starts (eight at right tackle and one at tight end). Stingily is an athletic lineman with good size. He plays more of a finesse, positional game. A better pass protector than run blocker, Stingily is not a physical player. 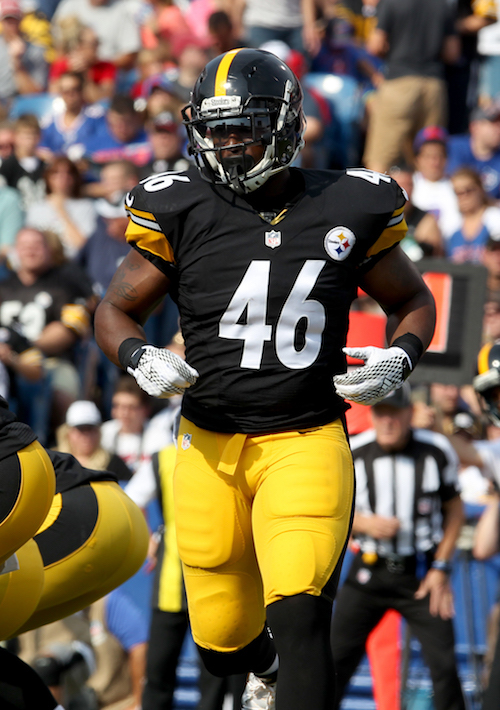 ESPN reports that the New York Giants are signing unrestricted free agent H-Back/fullback Will Johnson (Pittsburgh Steelers) to a 2-year contract. 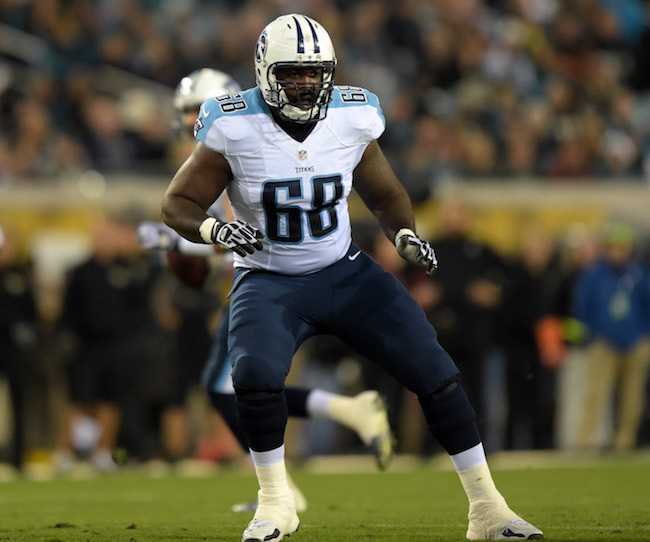 The 27-year old, 6’2”, 240-pound Johnson was not drafted and signed with the Steelers in 2012. In four seasons with the Steelers, Johnson only missed one regular-season game, and started 20 contests. He has 31 career receptions for 235 yards and two touchdowns. Johnson is versatile with the ability to play H-Back, tight end, and fullback. He is a good lead blocker who can also catch the football. Johnson is a solid special teams player. Johnson will likely compete with Nikita Whitlock for the team’s sole fullback spot. According to multiple media reports, the New York Giants have agree to terms with unrestricted free agent cornerback Janoris Jenkins (Los Angeles Rams). Early reports indicate that the deal could be worth as much or more than $70 million and average $12 million per year or more. The Rams were very interested in re-signing Jenkins and he was being heavily pursued by the Raiders and other teams. The 27-year old Jenkins was originally drafted in the 2nd round of the 2012 NFL Draft by the Rams. In his four seasons with the Rams, Jenkins played in 60 regular-season games with 58 starts. He has 49 career pass breakups and 10 interceptions, five of which he has returned for touchdowns. Jenkins is an average-sized corner with excellent speed and quickness. He is an instinctive coverman who has gotten better each year. Jenkins plays well in both man and zone coverage. Jenkins makes plays on the football, but is known as a bit of a gambler and will also give up the big play. He is not a physical run defender or strong tackler. Jenkins plays with a cocky swagger, but there are also some character concerns, including a drug charge in college. Multiple media sources are reporting that the New York Giants are interested in unrestricted free agent defensive tackle Damon Harrison (New York Jets). The 27-year old Harrison was originally signed as an undrafted rookie free agent by the Jets after the 2012 NFL Draft. In the last three years, Harrison has started every regular-season game for the Jets. In 2015, he accrued 72 tackles and 0.5 sacks. The 6’4”, 350-pound Harrison is one of the NFL’s best run-stuffing nose tackles. He does not get much heat on the passer. NJ.com reports that unrestricted free agent defensive end Olivier Vernon (Miami Dolphins) is now the top free agent priority for the New York Giants. The Dolphins removed their transition tag from Vernon on Wednesday, making him free to sign with any team without the right to match an offer. The cash-rich Jacksonville Jaguars are said to be very interested in Vernon. The 25-year old Vernon was originally drafted in the 3rd round of the 2012 NFL Draft by the Dolphins. In the last three seasons, he has played in every regular-season game with 46 starts, averaging 55 tackles and 8.5 sacks per year. NJ.com is reporting that the New York Giants had interest in unrestricted free agent wide receiver Marvin Jones (Cincinnati Bengals). However, Jones is signing with the Detroit Lions. The 25-year old Jones was drafted in the 5th round of the 2012 NFL Draft by the Bengals. Jones played in 16 regular-season games with 13 starts in 2015 and finished the year with 65 catches for 816 yards and four touchdowns. The New York Daily News reports that the New York Giants had expressed interest in unrestricted free agent cornerback Sean Smith (Kansas City Chiefs). The 28-year old Smith has played for both the Dolphins (2009-2012) and Chiefs (2013-2015). Last season, he started all 13 games he played in and accrued 45 tackles, 12 pass defenses, and two interceptions. 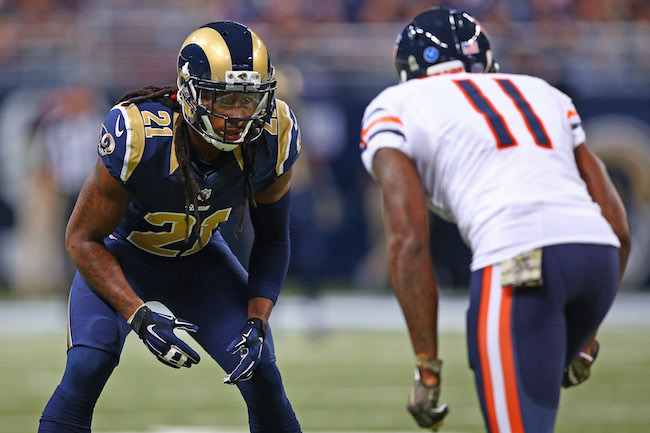 The signing of Janoris Jenkins may now mean the Giants are no longer interested. Despite initial reports of mutual interest and a possible visit, free agent defensive end Mario Williams signed a 2-year contract with the Miami Dolphins. 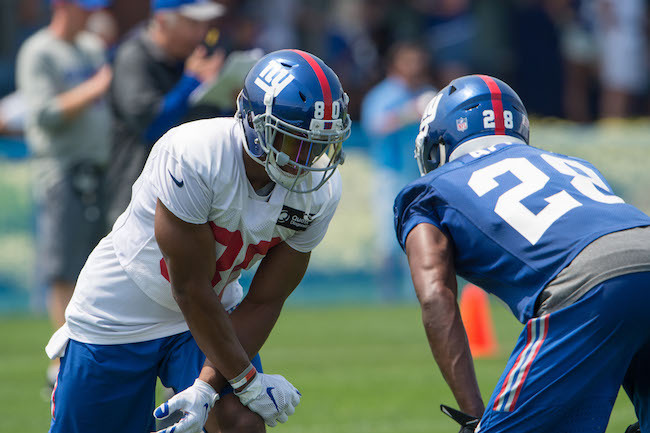 According to the NFL Player Associations website, New York Giants exclusive rights free agent safety/cornerback Bennett Jackson has signed his 1-year, $450,000 tender. Jackson was placed on Injured Reserve before the season started in September 2015 after tearing the ACL in his right knee in the second preseason game. 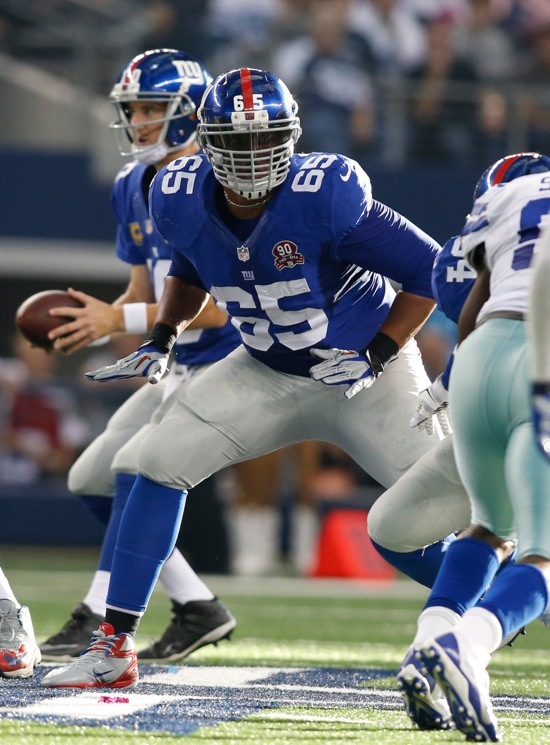 The Giants drafted Jackson in the 6th round of the 2014 NFL Draft. During his rookie season, he was waived, signed to the Practice Squad, and then placed on the Practice Squad/Injured List with cartilage damage to his left knee injury that required microfracture surgery. Jackson converted to cornerback from wide receiver at Notre Dame. The Giants shifted him to safety during the 2015 offseason. Jackson is a bit of a corner/safety ‘tweener. While he he has good speed and coverage skills for a safety, he lacks ideal size and physicality for the position. Before he was injured, Jackson was receiving first team reps at safety and as the team’s nickel corner. The player not tendered was wide receiver Marcus Harris. Scouting reports on these players are available in the Scouting Reports section of the website. New York Giants wide receiver Victor Cruz revealed on Thursday that he has begun running as part of his rehab process recovering from calf surgery. Cruz did not play in any preseason or regular-season games in 2015. Cruz was placed on Injured Reserve in November 2015 due to a left calf injury suffered in August that never healed and required surgery. It is the third leg injury that Cruz has suffered since signing his big 6-year contract in July 2013, including arthroscopic surgery on his left knee in 2013 and career-threatening patellar tendon surgery on his right knee in 2014. Cruz is currently set to count $9.9 million against the team’s 2016 NFL cap, the second most by a player after quarterback Eli Manning. It has been speculated that if Cruz does not accept a pay cut, he may be released from the Giants. Cruz recently said that he believed there was an “80 percent” chance he would return to Giants.